March is National Women’s History Month, and I am writing this posting on International Women’s Day. If I had the twelve hours–round trip– to hit the road, I’d head for the Women’s Rights National Historical Park in Seneca Falls, New York, and celebrate how far we have come as a nation. It would definitely be a work-related trip. The U.S. Government Printing Office (GPO) printed Elizabeth Cady Stanton’s most famous– and in her estimation, her best– speech in 1915. She delivered her address, Solitude of Self, before the Committee on the Judiciary on January 18, 1892. She argued why the law needs to treat women as equal citizens under the law and she argued for women to get the vote via a law that would eventually became the Nineteenth Amendment to the Constitution. 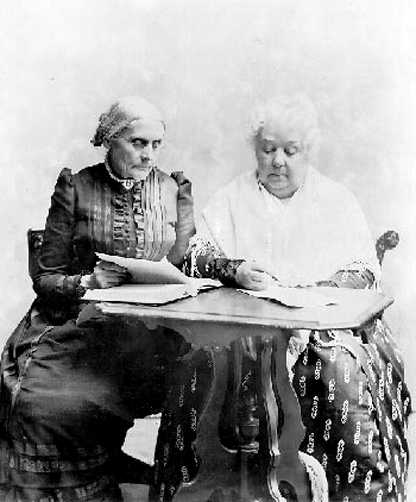 Image: Susan B. Anthony (left) and Elizabeth Cady Stanton (right). Source: The Susan B. Anthony Center for Women’s Leadership. Sadly, it took forty-two years after Stanton and fellow suffragist Susan B. Anthony first drafted the 19th amendment in 1872 and long after their deaths for the amendment to finally be ratified and made law in 1920. Since Stanton’s house is part of the park, it’s here that you can discover a very human portion of United States history and feel a renewed sense of the privilege that all United States citizens have to vote. Not only can you learn about Stanton at the park, you can also get a wider view of the earliest stages of the women’s rights movement in the United States. Four historical properties and a visitor’s center make up the park. You can visit the Wesleyan Chapel in Seneca Falls where the leaders of the women’s rights movement held the First Women’s Rights Convention in August 1848. Stanton’s home is open from spring through fall. You can tour the house she referred to as “the Center of the Rebellion” where she raised her large family while networking with other women on women’s rights reforms. 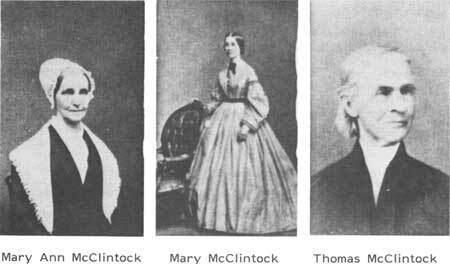 Another one of the four park properties, the M’Clintock House in nearby Waterloo, was the home of Mary Ann and Thomas M’Clintock. While in Waterloo, you can walk by the Hunt House, where Jane and Richard Hunt hosted Lucretia Mott and held an assembly for her where the attendees announced the plan for the First Women’s Right’s Convention. Although you can’t tour the Hunt House now as it is too fragile, the National Park Service (NPS) is making plans to restore it in the future. Visiting these locations brings home the exciting sense of purpose and activity of the American women’s rights movement of the late 1800s. Information about all of these sites, as well as slideshows of the historical houses, the text of Stanton’s address, historical factoids, and photos of the major architects of the women’s rights movement and their supporters, are available at the Women’s Rights National Historical Park brochure online. Even if, like me, you can’t get to upstate New York to see these sites in person, you can (almost) feel like you’ve been there once you’ve given the park Web site a thorough visit. It’s worth the time it takes to make the trip, whether actual or virtual. It’s amazing to see how far we’ve come as a nation in the advancement of personal rights, and how much all of society (men and women) have done to push our mothers, sisters, aunts and daughters forward. Having that perspective is one of the many advantages of learning about the park. Continue your self-education by reading the park brochure at your local Federal depository library. You can find it either via the title’s PURL (Permanent URL) or through the Catalog of Government Publications (CGP) record that GPO cataloged for the Federal depository libraries in the March 2013 record load. How can I access this publication, the Women’s Rights National Historical Park web brochure? Find the records for these titles in the Catalog of Government Publications (CGP) maintained by GPO. This entry was posted on Tuesday, March 26th, 2013 at 5:23 pm and is filed under African Americans, Congress, Libraries, Library of Congress (LOC), National Park Service, Women. You can follow any responses to this entry through the RSS 2.0 feed. You can leave a response, or trackback from your own site. I concur. Sometimes it is very hard to believe how bad things were, and look how things have changed. Do you think there are more areas for improvement regarding this issue? Now : There are The Men, Also The Women…….. These moments are rarely before. Now, both of them need to join to reach their target together and the men know their partner so much to help them. Women are inspire of all, psychic, spiritual and performance. Congratulations to National Women’s History Month!